Are you a new client? Click here. SHOP >> INTERESTING ARTICLES >> ISABEL "LA CATÓLICA"
We can make direct shipments to United States of all products that we have on our website. Shipping costs are automatically calculated after adding products to the shopping cart. The delivery Time of our products varies between ten and fifteen days. Isabel was born on 22nd April in 1451 in Madrigal de las Altas Torres (Avila). She will be King John II of Castille´s third daughter, married for the second time with Isabel of Portugal, the future Catholic Queen´s mother. Her childhood transcurred in Arevalo, where her mother moved short after being widowed. The period in Arevalo was not very nice, because her mother soon started to show proofs of her madness. We know very few of her instruction, and we suppose that in those years she learn to read and write. Picture of Isabel "La Católica"
In 1464 King Henry the fourth, her brother, took her to his court, giving her incomes, and a villa in Casarrubios del Monte. The relationship between both brothers was really closed and Henry showed proofs of dear to the young Princess and also to her other brother Alfonso. The situation in Henry´s court is not very gratified because the nobels wish to take away more power from the legitimate monarch, provoking a great confrontation between those who wanted a strong monarchy and those who prefer a manageable monarch from who they could obtain all kind of goods and graces. At that moment, a meaningful fact known as "Farsa de Avila". When in a grotesque ceremony, the nobels took the crown from Henry IV and named king of Castille Prince Alfonso, arguing that the heiress Juana is illegitimate because she is daughter of the love between the queen and Beltran de la Cueva, from where it comes the name Beltraneja, as the Princes is known afterwards. Isabel maintained appart from these stratagems, but she started to act very soon. 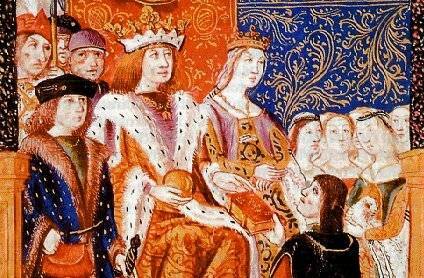 Prince Alfonso´s death in 1468 provoked that his followers chose the young Princess as the new candidate to take the crown to Henry. The aim of the nobelty was to have a manageable person to follow their personal interests. At this context, it was signed the Pact of the "Toros de Guisando" (1468) in which Henry named his sister Isabel as Princess of Asturias, confirming that his daughter Juana was illegitimate. It is curious that, Isabel, whose posibilities to reign in Castille were minimum when she was born, she became the sucessor to the thrown. As Princess of Asturias, Isabel should choose a good husband to marry. There were several candidates to this political marriage: Alfonso V of Portugal; D. Pedro Giron, mester of Calatrava, and Fernando of Aragon, heir to the neighbour crown. The choice was consumated in Ocaña, where Isabel chose Fernando. Isabel "La Católica" Fernando "El Católico"
The marriage was celebrated in Valladolid on 19th October in 1469. The archbishop Carrillo had to represent a false bull because both the newly-weds were cousins, having John the first of Castille as common ancestor. The civil war was near, although they will still pass several years till it exploded. 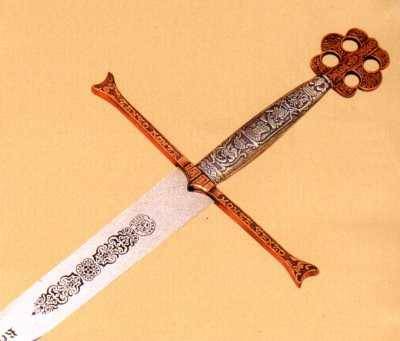 Firstly, Isabel and Fernando hardly ever had allies, retiring to Medina de Rioseco, but the number of followers was rising progresively: the Vasque Country, Borgoña, Rome and specially the powerful family Mendoza. Isabel´s position is stronger and it seems that Henry himself wanted to negociate. But at that moment, the monarch died in Madrid, at the night between the 11th and 12th December in 1474, without writing the will. Taking into account the Trate of "Los Toros de Guisando", Isabel proclamed herself queen of Castille in Segovia, on 13th December. 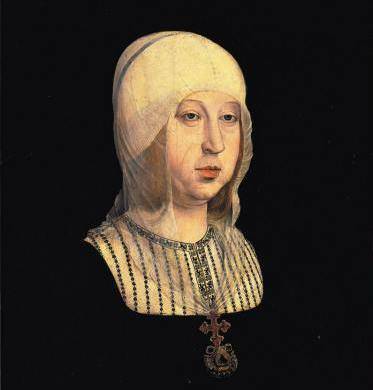 In January in 1475, it was signed "La Concordia de Segovia" between Isabel and Fernando, where it was produced a distribution of competences between both monarchs.Isabel is "queen and owner of Castille" and her husband receive the tittle of king. From that moment, that couple formed an unseparable block and they together can confront the war. The civil war was between 1475 and 1479, and it became and international war participating Portugal and France supporting Juana while Aragon supported Isabel. The Portuguese defeat near Toro(1st March in 1476) and the French difficulties to invade territories in Guipuzcoa thanks to the Vasque marine that turn into Isabel. For three years, they will smother the points of resistence in Extremadura and Andalucia, what demonstrated that isabelian cause was not so established. The Treates of Alcaçovas (September in 1479) finished with the fight, and from that moment, Isabel is firmly settled in her thrown. At that year, 1479, John the second of Aragon died, and Fernando became king of Aragon, and it began the dinastic union between Castille and Aragon. The foundations of the modern State were locating in the Iberian Peninsule.To strengthen the royal power, they were followed a series of important measures, most of them in the Parliament: the Constitution of "La Santa Hermandad" with police and judicial aims (Madrigal de las Altas Torres, 1476); the reorganization of the Royal Council, the enlargement of the competences of the coregidor, (Toledo, 1480); regulation of the Royal Property; revision of the otorged duties to the nobels by Henry IV; incorporation of the maestrazgos of the Military Orders to the Crown, when naming Great Mester to Fernando;the establishment in Valladolid of the Royal Canceller, and creating a second Canceller in Granada (1505); creation of a permanent army that has as the central aim, the Royal Guards, the urban milicies, and Santa Hermandad. 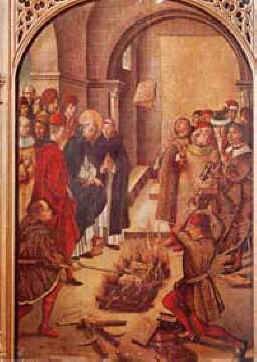 In religious matters, it was produced the expulsion of the jewess (1492); the reformation of the religious orders, done by the cardinal Cisneros; and the creation of the Inquisition in Castille (1478) thanks to the bull "Exigit sinceras devotionis affectus" proclaimed by Sixto IV with which it is conceded to the kings the power of naming two or three bishops to perform the post of inquisitors, and they were produced the first sentences in Sevilla during 1481. In 1492 they happened three very important facts for Spain:the conquer of Granada, the conquer of the Canary islands and the discovery of America thanks to Columbus. These three episodes can be related with the foreign politics developed by Isabel and Fernando, directed to expand the iberian domains to estrenghten the Crown as an international power, confronting with France. It is true that the line drawed by Fernando has as aim the expansion into the Mediterranean-Italy and Sicilia- but with these new contributions Castille opened into the Atlantic Ocean. Thanks to the bulls "Inter Caetera" (May 1493) the Pope Alejandro the sixth conceded the soberanity of the discovered territories. This Pope himself will be who conceded the tittle of Catholic Kings in 1904 to Isabel and Fernando, which all their heiresses will also have. Inside the foreign politics, it should be emphasized the politics of marriages designed by the Kings for their children. All the marriages are directed to asolate France: Isabel would marry the Portuguese Prince D. Alfonso, and after enwidowing, with his heiress, D. Manuel (the lucky); John will marry Margarita of Austria, Emperor Maximiliano the first and Maria of Borgoña´s daughter; Juana will marry Felipe of Austria, also the Emperor´s son; Maria will marry her brother-in-law, the widower D. Manuel of Portugal; Catalina will be the first Henry VIII of England´s wife. Portugal, the Empire and England, surrounded the French reign with their offsprings. Fernando´s design couldn´t be more perfect. 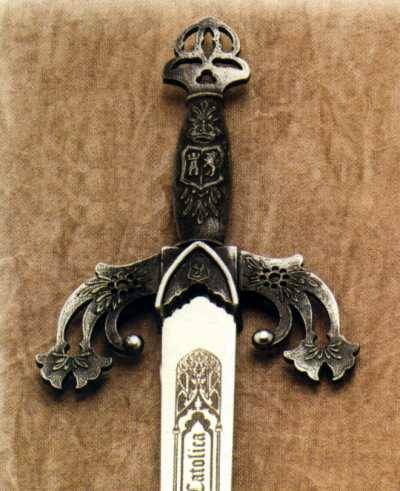 Prince John´s death in 1497 will provoke a depression to D. Isabel, maybe for succesive motives. With Isabel´s death (1498) and her son Miguel´s (1500) the will leaves her daughter Juana as heiress and owner of the Castilian Crown. 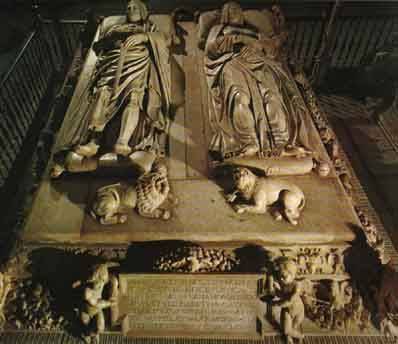 Picture of Juana "La loca"
D. Isabel´s body was taken to Granada where she will be buried, and at the present we can appreciate a marvellous mausoleum, created by Domenico Fancelli, in the real Granadian Capille, accompanied by her husband Fernando. Tomb of the catholic kings in the cathedral of Granada.